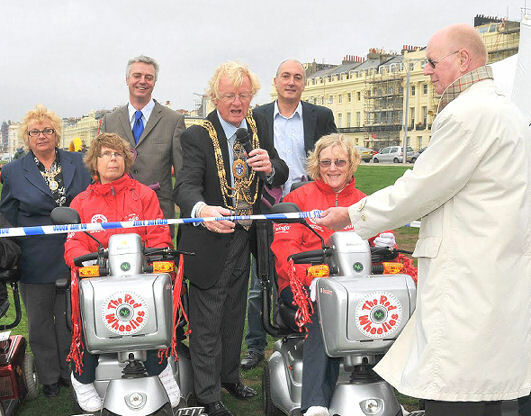 The Wheelie Great Scooter Rally and fun day was held this weekend at Hove Lawns. Organised by Age Concern Brighton Hove & Portslade and Sussex Safer Roads Partnership, the event was officially opened by The Mayor and Mayoress, Councillor Geoff and Mrs Sally Wells. The host for the day was Guy Lloyd from Juice107.2 Breakfast Show. There was a lot to see and fun activities for kids. The ‘Red Wheelies’ (think Red Arrows) displayed their mobility scooter skills, to raise money for their new MS therapy centre and there was an impressive display of wheelchair dancing. Age Concern BHP has been active in the City of Brighton & Hove for 45 years, providing practical care services which are a lifeline for local older people when they are their most vulnerable. 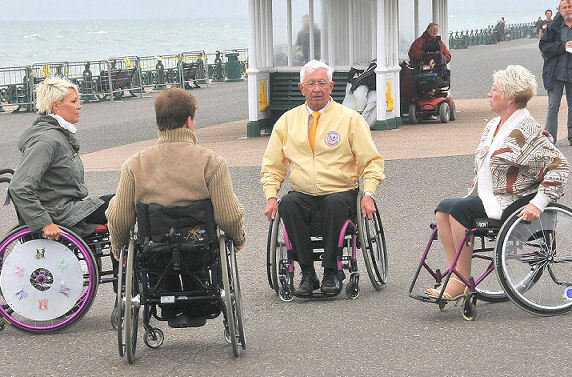 Their mission is also to encourage those in later life to be active, have fun and empower them to support each other, by volunteering, socialising and embracing new technology. You can visit their website here. I can’t see/open the pictures? Editor’s note: Sorry you are having problems Steve – but there is nothing wrong on the website as the two photographs are visible to everyone who has visited the page so far. Can only assume it is a problem your end. Try emptying your cache memory?